The flavour of the best summer cherry tomatoes and date tomatoes in a delicious ready-to-use sauce you should always have in your kitchen. 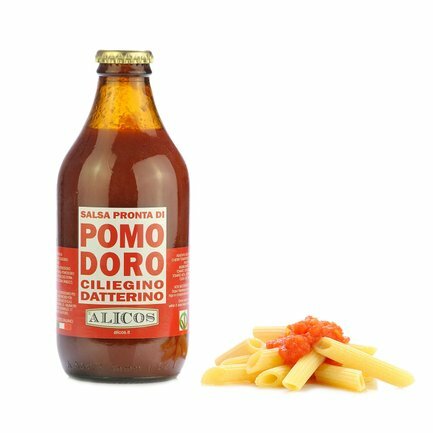 The high sugar content, bright red colour and a soft and delicate flavour...this sauce will give your pasta a unique flavour! 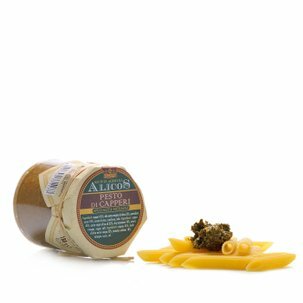 Try the Alicos sauce also together with other recipes - be creative! Ingredients Cherry tomatoes 55%, date tomatoes 42%, extra virgin olive oil, basil, salt. For more information on product labels, please contact our Customer Service department. The information on the labels of the products may vary for reasons beyond our control, therefore, there may be discrepancies between the information on the site and that on the products delivered. Please always check the information on the product before consumption or use. Azienda Agricola Alicos was founded in order to maximise the appreciation for Sicilian products, especially those from the area of Salemi, where the company's first production facilities were located. In addition to producing high-quality olive oil, it also produces conserves, prepared in accordance with antique Sicilian tradition, paying close attention to the selection of the ingredients and using optimal extra virgin olive oil, which gives them a unique flavour.